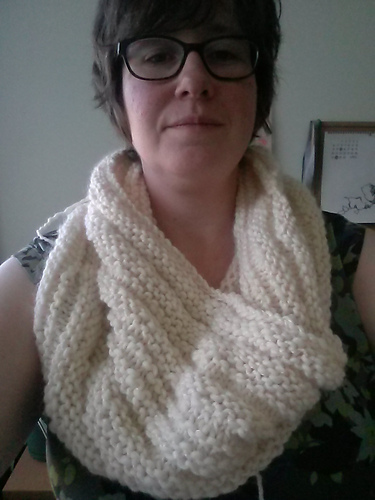 I started out thinking about doing a cowl that was all yo/k2tog, but didn’t like the feel of it, then did a round of k1/sl1, but had trouble keeping track of it. So now it’s just a semi-random pattern of knit rounds and purl rounds, something to keep my hands busy in meetings. FWIW, I knitted 3 rows of the pattern wrong (reading the chart left to right instead of right to left), then picked back 2 rounds. Kinda mangled the beginning of the decreases, because I was working on it during a divisional retreat. (NTS: don’t do that!) 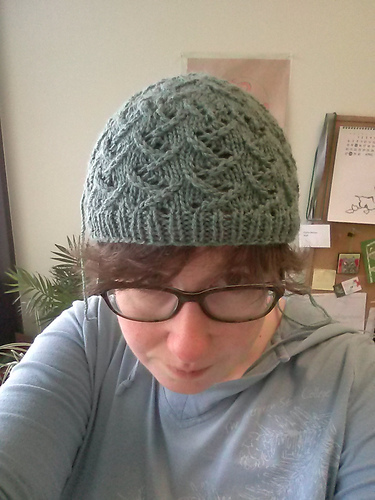 But got it back in pattern pretty quickly, and am overall quite pleased. Seems a bit small, hoping it’ll grow with wear and/or blocking. Almost precisely the right amount of yarn for the pattern, too! Like the pattern quite a bit, would like to try making it again.